Colour: Basically ochraceous yellow or light brown due to pigment present in the choanocytes. Commonly the colour is transformed into a deep blue, (or a dull green or a bright orange yellow,) by the presence of symbiotic algae, at least in the superficial parts of the sponge. Consistency: Sponge is generally fairly soft. Surface: Surface smooth, very occasionally minutely hispid. Apertures: Oscules are minute - not distinct to the naked eye. Skeleton: The skeleton is confused rather than subradial and the megascleres are not clearly divided into two size groups. There is a somewhat disorderly and loose arrangement of tylostyles, of which a few are usually directed vertically upwards. The tylostyles may be single, or united in places to form bundles or brushes which cross one another in all directions. The tylostyles in the bundles all point in the same direction, the heads and points tending to occur side by side. The spicules may be sparse or crowded depending on the individual. The ectosome does not have a tangential skeleton. Spicules: The tylostyles "(ca. 250-400µm)" have a well-developed head with a rounded apex, often with a ring-swelling around the middle or base. The head may also appear heart-shaped in optical section, i.e. wide at the base next to the shaft and narrower, but rounded, at the apex. The smooth shaft may be straight, but usually curves gradually along its length. Sometimes there is a more pronounced curvature at about 1/3 to 1/4 of the length from the head. The shaft becomes thinner distally, ending in an acute point. Habitat: On rocky surfaces and the undersides of boulders. In the Mediterranean it occurs on algae and other sponges. It has been recorded as "on bryozoans and corals.". It is found both littorally, at low water spring tide levels, and sublittorally to 68m. The bright orange-yellow form (if this is really the same species!) only occurs sublittorally. Distribution: Atlantic, North Sea and Channel coasts of Europe; Mediterranean, etc. 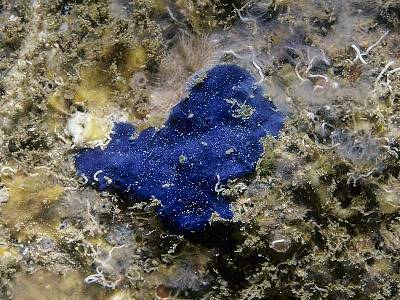 Identity: The deep blue variety is one of the few examples of a blue British sponge (see also Hymedesmia paupertas, this Guide). The spicule arrangement and tylostyles are characteristic and can be seen under the microscope. Voucher: MNHN Paris : D-T-2476.